Koodo Mobile knows that 'bigbillification' from wireless companies can be hard to swallow, especially with the cash crunch created by gift-giving. 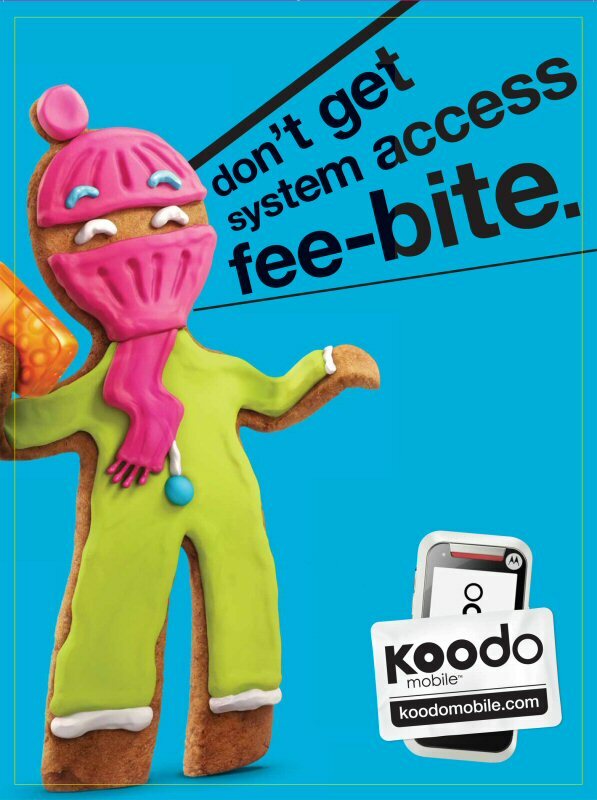 That's why Koodo, Canada's decidedly different wireless company, enlisted gingerbread characters to remind Canadians how sweet it is to save this holiday season. Warm Digits: An in-store and on-the-street campaign that will offer weary holiday shoppers across the country a sweet treat served by Koodo's gingerbread characters, along with cash-conserving tips. Can YOU catch the Gingerbread Man? A gingerbread gymnast, ladies' man and mischievous master of elusion, the stupendous Sugar Streak takes users on a live-action, edge-of-your-seat chase though the urban jungle. Those who catch him are rewarded with the latest money-saving info about Koodo's products and services. The game was created using recently-unveiled interactive Flash technology from YouTube, which allows players to direct game play in a "choose your own adventure" format. "Our customers are very active in social media and we wanted to engage them where they play -- we thought they'd get a kick out of this new YouTube feature," says Kevin Banderk, Chief Koodo Officer. "We brought our playful and cheeky brand identity to life in celebration of the season. The gingerbread campaign builds on our Language of Savings and reflects our ongoing commitment to quality wireless at a price that doesn't leave a bad taste in your mouth. We apologize in advance to employers for lost productivity as result of Sugar Streak – it's addictive!" In addition to its online holiday initiatives, Koodo is spreading seasonal sentiment on the streets as well. Koodo's Warm Digits crew has a sweet treat for you and it doesn't matter if you've been naughty or nice! Koodo gingerbread characters in costume will be giving out gastronomic goodies for frozen fingers at subway stations, street corners and stores across the country in Random Acts of 'Ginger-ocity'. Saving – the gift that keeps on giving: If you're giving a cell phone as a gift to a young person this holiday season, select plans with unlimited text, per second billing and No System Access Fee. By doing so, you'll prevent 'cell shock' when the first bill arrives. You'll also make it easier for the recipient to manage the payments if you expect them to eventually take over the bill. "In addition to our $25 off promo on our QWERTY mobile phones, we wanted to do something simple and fun to celebrate the holidays because staying connected should always be fun, simple and affordable. That's why we've always offered text messaging with all our plans, per second billing and the Koodo Tab instead of a fixed-term contract" adds Banderk. "We're also offering a $100 bonus gift to new subscribers purchasing QWERTY handsets, so Koodo is truly a gift that keeps on giving." Launched in March 2008, Koodo Mobile is Canada's simple, affordable and flexible mobile alternative for those who just want to talk and text. Koodo Mobile offers a transparent approach to cellular service with per-second billing and no fixed-term contracts. Service plans are pre-packaged or build-your-own. Customers have the option to purchase a phone or take advantage of the revolutionary Koodo Tab. Visit koodomobile.com for information and retailers. To view the photo associated with this press release, please visit the following link: http://www.marketwire.com/library/20091209-gingLG1.jpg. To view the video associated with this press release, please visit the following link: http://www.youtube.com/sugarstreak. The latest campaign from Koodo Mobile, Canada's back-to-basics wireless provider, uses the goodness of gingerbread to remind Canadians how sweet it is to save on wireless service this holiday season.